That is the image it brings to mind when we sing Joy to the World. However, it is not the image Isaac Watts had in mind when he wrote that familiar song. 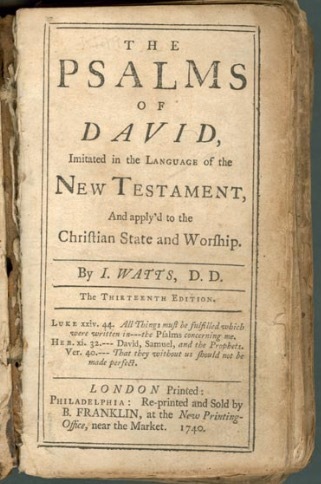 It was originally published in his 1719 hymnbook titled The Palms of David: Imitated in the Language of the New Testament and Applied to the Christian State and Worship. How’s that for a catchy title? Seeking to energize congregational worship, Watts set out to write hymns based on the Psalms “in such a manner as we have reason to believe David would have composed them if he had lived in our day.” Some have called Isaac Watts the Chris Tomlin of his day. Watts composed the words of Joy to the World based on Psalm 98, specifically the verses cited above. If you focus on those familiar lyrics, you can’t help but notice that there is no mention of those scenes and characters we all know so well from the Christmas story as told by Luke. That is because Watts wrote the lyrics of Joy to the World with the Second Coming of Christ in mind, rather than his birth. Several years ago, I began the practice of reading a different gospel account each month while continuing to read through the rest of the New Testament every six months. Following this schedule means that each December, I find myself both in John’s Gospel and in Revelation, John’s account of Christ’s return. The combination of those two books of the Bible remind me that I live between two world-changing events – Christ’s incarnation, death, and resurrection and his promised return to gather those of us he died to save. May each of you enjoy a Christ-filled and Christ-focused Christmas this year. Watts composed the words of Joy to the World based on Psalm 98, specifically the verses cited above. If you focus on those familiar lyrics, you can’t help but notice that there is no mention of those scenes and characters we all know so well from the Christmas story as told by Luke. That is because Watts wrote the lyrics of Joy to the World with the Second Coming of Christ in mind, rather than his birth. As I have prepared my heart for Christmas this year, I have found myself focused on the return of Christ perhaps as much as his birth. Several years ago, I began the practice of reading a different gospel account each month while continuing to read through the rest of the New Testament every six months. Following this schedule means that each December, I find myself both in John’s Gospel and in Revelation, John’s account of Christ’s return. May each of you enjoy a Christ-filled and Christ-focused Christmas this year, celebrating his birth while anticipating his glorious return.